Brexit Secretary Dominic Raab admits there probably won’t be a time-limited Brexit backstop. Theresa May’s government originally told the EU it could not accept any backstop arrangement without a fixed end date. The backstop is the insurance policy for protecting the invisible Irish border. Pro-Brexit Conservatives have said they will not accept a backstop without a specific end date. However, Raab and another Brexit minister, Suella Braverman, admitted on Sunday that the government is prepared to scrap that red line. May faces another dangerous week with Conservative MPs urging each other to oust her. 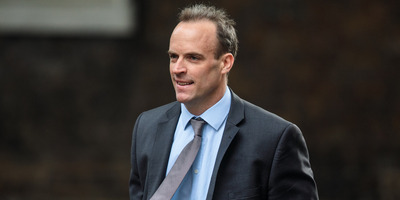 LONDON – Dominic Raab and another UK Brexit minister have conceded that the Brexit “backstop” probably will not have a fixed end date, putting Theresa May’s government on a collision course with pro-Leave MPs. Pro-Brexit MPs both in the prime minister’s Cabinet and on the Conservative backbenches have said that the backstop clause for preserving the frictionless Irish border after Brexit must have an explicit end date. This is because they fear the backstop could result in Britain remaining in the EU’s customs arrangements for years or potentially decades to come, leaving UK governments unable to sign new trade deals with other countries. However, at the European Council summit in Brussels this week,May effectively killed off the prospect of a fixed end date, refusing to deny reports that she told the Irish government there will not be a specific time-limit. On Sunday morning, UK Brexit Secretary Raab told Andrew Marr that the backstop clause, which both sides need to resolve for there to be any Brexit deal, might have “another mechanism” rather than an explicit end date. He was echoed by Brexit minister Suella Braverman, who told Sky News that the length of the backstop could be determined by an alternative “very clear mechanism,” such as conditions for deciding when it can be removed. Raab and Braverman’s comments square with the latest noises coming out of Brexit negotiations. A Cabinet source told BI this week that May was focused on creating something which “feels” like a time-limit, rather than an actual end date. Her spokesperson also suggested that she was willing to scrap the time-limit red line, telling reporters that her priority was establishing “a mechanism to clearly define how” the backstop will end. The UK government’s apparent concession comes as May prepares for perhaps the most dangerous week of her premiership, with MPs on all sides of her party calling for her to step down as Tory leader and prime minister. Johnny Mercer, one of the party’s most highly-rated MPs, said he “cannot continue to support an administration that cannot function” amid heavy speculation that May could face a leadership challenge this week. 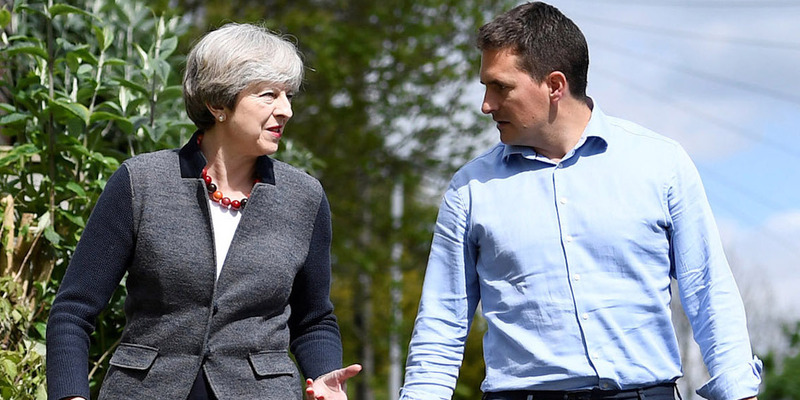 Dylan Martinez/WPA Pool/Getty ImagesTheresa May and Johnny Mercer MP. The current impasse in Brexit talks hinges on the so-called “backstop,” which is designed to prevent a hard border emerging between Northern Ireland and the Republic of Ireland after Brexit. Under May’s preferred version of the backstop, the whole of the UK would effectively stay in the customs union temporarily after the 21-month transition period has ended if no alternative arrangements have been secured. Pro-Brexit Conservative MPs have been adamant that such an arrangement would have to come with a fixed end date to ensure that Britain doesn’t end up trapped in the EU’s strict customs regime for years and years. A Cabinet source told BI last week that pro-Brexit ministers Andrea Leadsom, Esther McVey, and Penny Mordaunt could quit if there is no fixed end date. This isn’t just one more little compromise from the prime minister to get a deal over the line… it is the litmus test for taking back control… this is the killer moment, they said.